Question Answers, Critical Appreciation, Translation In Nepali, Word Meanings In Nepali Of "The Tiger". 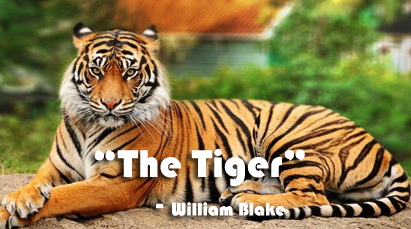 "The Tiger" was written by William Blake. He was a famous romantic poet. He expressed himself in simple language so that the reader could feel the depth of common everyday things. He was also an engraver and a famous painter. He was a philosophical poet and his philosophy was that man must attempt to rise to a state of higher innocence. He wrote The Songs of Innocence and The Songs of Experience, which describes the two contrary states of human soul. "The Tiger" is taken from The Songs of Experience. The tiger is a fierce (भयानक) wild animal which stands for the necessary force to break the bonds of experiences in our soul. It is the supreme power in the forest that is symbolic of divine spirit which is not surpassed (पराजित भएको) by any other forces. William Blake presents the tiger as the symbol of fierce force in the soul that is necessary to break the bonds of experience. It also stands for a divine spirit that will not be subdued (पराजित भएको) by restrictions, but will arise against established rules and conventions. Fallen from a state of innocence to a state of experience, man must attempt to rise to the state of higher innocence. This is the philosophy of the poet. According to him, to rise to the state of higher innocence the bonds of experience should be broken down. So the tiger, not an ordinary tiger of blood and flesh, is the symbol of that force necessary to break down the bonds of experience. बाघ ! बाघ ! अध्यारो जङ्गलमा उज्यालो गरी चम्किरहेको छ। कुन अमर हात वा आँखाहरुले तिम्रो त्यो भयंकर एवम सन्तुलित आकृति बनाउन सक्यो होला ? तिम्रा आँखा समुद्र अथवा आकाशका दुरीसम्म चम्कन्छ्न् होला ? कस्ता पखेटामा उड्ने हिम्मत गर्यो होला ? कस्ता हातले आगो समात्न सक्यो होला ? अनि कुन पाखुरा र कुन कलाले तिम्रो मुटुको स्नायुलाई बटार्न सक्यो होला ? र जब तिम्रो मुटु धड्कन सुरु गर्यो, आहा क्या डरलाग्दा हात, क्या डरलाग्दा खुट्टा ? मार तोल कस्तो थियो होला ? अनि तिमीलाई बाँध्ने सिक्री कस्तो थियो होला ? कस्तो भट्टीमा तिम्रो दिमाग राखिएको थियो ? कस्तो लि थियो होला ? कसरी यस्तो भयंकर डरलाग्दो जीवलाई समात्यो होला ? जब ताराहरुले आफ्ना भालाहरु उँधो तिर फाले र स्वर्गलाई आफ्ना आँशुहरुले सिञ्चन गरे, के ऊ (ईश्वर) आफ्नो काम देखेर रमायो होला ? भेडाको पाठो बनाउनेले नै तिमीलाई बनाएको हो त ? बाघ ! बाघ ! अँध्यारो जङ्गलमा उज्यालो गरी चम्किरहेको छ। कुन अमर हात वा आँखाले तिम्रो त्यो भयङ्कर एवं सन्तुलित आकृति बनाउन सक्यो होला ? Answer: The "forests of the night" simply means forest at night. Forest is the place where tiger lurks (पल्याकपुलुक गरेर हेर्छ). The forest of the night is the symbol of darkness and innocence also. Answer: The tone of the poem means the writer's attitude, manner, mood and moral outlook in his/her work. The poet is describing 'tiger' but not a simple tiger of bone, flesh and blood. In this sense the tone is descriptive (वर्णात्मक). The description of unique thing is amazing. The poem is full of emotional questions without any expectation of answer since it is embedded (निहित) in the questions itself. The rhetorical questions generate an intense (तिब्र) excitement. The poet is indirectly questioning the unequal creation of God in the poem. As described earlier, the tiger is not an ordinary tiger rather it is the symbol for the fierce forces in the soul that are necessary to break the bonds of experience. The 'lamb' in this poem signifies (जनाउँछ) the state of innocence, the physical feature of it (meek and delicate) is also symbolic of it. In this sense the poet sets the tone of contrast between the super power and the powerless among the creatures created by the same god. Answer: Stars are the symbol of rationality (विवेकशीलता), imposed regularity, law and order. Law and order is always afraid of super power. So, the 'stars' disapproved (असहमत भए) of the god's action to create the tiger as contrary power to lamb. So the stars threw spears as the sign of defeat and watered the heaven with their tears. Answer: The last stanza is the repetitive form of the first stanza with slight (थोरै) but significant change in word and their meaning. "Could" used in the last line of the first stanza indicates the ability or knowledge of god to give a definite shape to the tiger. But the "Dare" in the last line of the last stanza means something different. The rhetorical question is related to the challenge to do something dangerous or difficult. Answer: The poet is describing the tiger, not the tiger of blood, bone and flesh. The physical feature of tiger is fearful and extra-ordinary. The eyes shine like blazing fire (दन्कँदो आगो) through the thick forests in dark nights. This fearful form must have been made by some immortal hands. The materials needed to create such an extraordinary creature must have been brought from distant sky or sea. The hands to twist the body to give it distinct form must be very strong and powerful. The hammer and the anvil and the furnace in which the brain of the tiger was kept must have been the extra ordinary ones. In this sense the maker of such an extraordinary creature must be divine. No mortal can create such a ferocious (भयंकर) animal into so harmonious (मिलेको) shape. Were thy eyes of fury rolled. Answer: Run on lines in the poem show something on process or the continuation of something. The poet is describing the process about how such ferocious (डरलाग्दो) creature was created. The poet's intention to let the last line of the third stanza run into the next stanza as a single sentence would have lost the sharpness and precision of the poem. The poem is enough to convey the poet's message without adding the above stanza to the poem. Burnt the fi re of thine eyes ? On what wings dare he as pire ? what the hand dare seize the fire ? 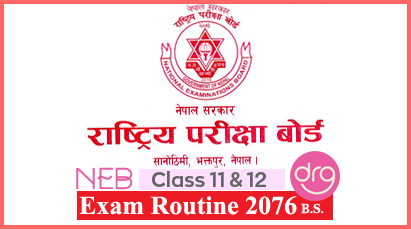 Class 12 Course "The Tiger"
Critical Appreciation Of "The Tiger"
Translation In Nepali "The Tiger"
Word Meanings In Nepali Of "The Tiger"
Question Answers Of "The Tiger"
0 Response to "The Tiger | Critical Appreciation | Translation In Nepali | Word Meanings | Question-Answers"